Hola! I just returned from a wonderfully relaxing five days at one of my most favorite spots ever, the Banyan Tree Mayakoba. Not only is this resort truly breathtaking but it holds a very special meaning for Doug and I as the location of our wedding. This trip was filled with sun, ocean, delicious fresh food, lots of family time and a little alone time as well. Here are some highlights from our trip south of the border! Flights are super dehydrating so as soon as we landed, cleared Immigration and Customs and got our luggage I was so psyched to have this delicious Coconut Water from Pure Nutrition waiting for me in my suitcase. It was still slightly frozen but the June in Mexico heat took care of that quickly! My go to lunch while in Mexico is always the same. 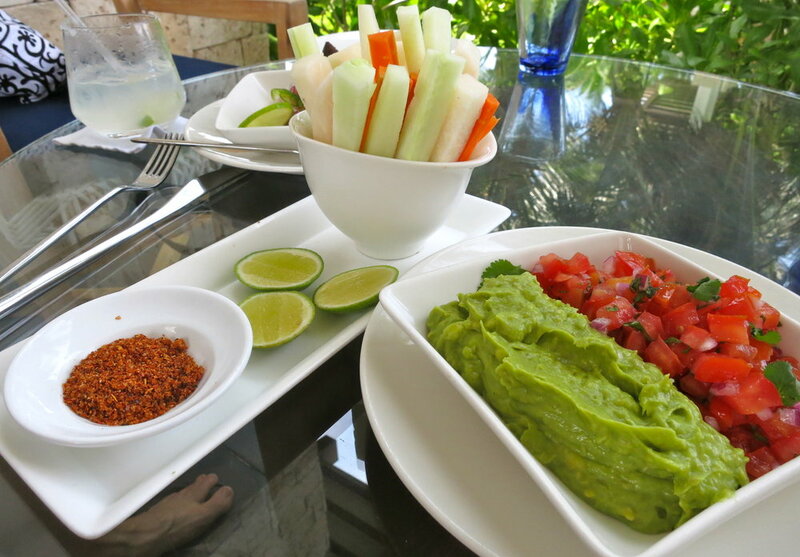 Guacamole (I am a guac connoisseur and the Banyan Tree's is amongst my favorites), fresh salsa, crudite, and tejin(mexican chill salt). Yum. Each day on the beach I would order a coconut. There is nothing that says Mexico more to me than drinking fresh coconut water and eating fresh coconut meat on the beach! Hydrating, satisfying and just perfect. To celebrate my father in law's birthday we had a Mexican Parrillada (BBQ) in our villa. To start we were served this delicious tasting plate family style which included guac, different salsas, and ceviche. I almost filled up before dinner. Almost. In a rare departure from my guac and veggies lunch Doug and I shared grilled hearts of palm and cactus one day poolside. It was lovely and reminded me of the grilled cactus we served at our wedding. 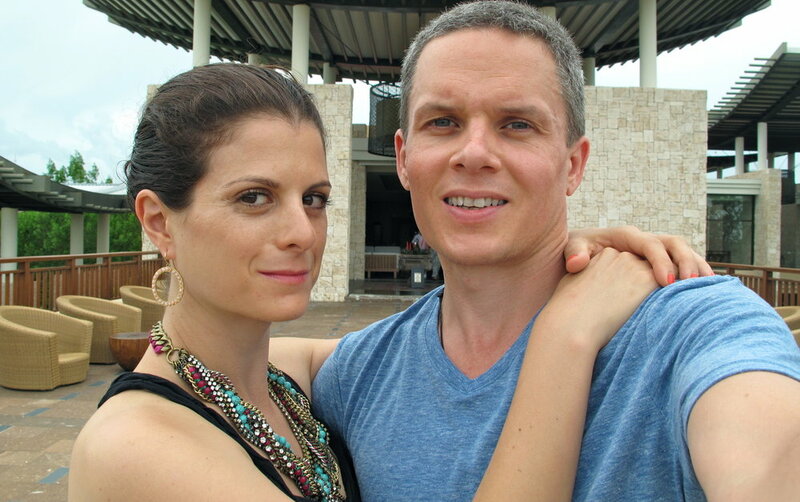 Speaking of our wedding, I surprised Doug one night before dinner with a visit to the spot where we exchanged vows. I had packed our original handwritten vows in my suitcase and we read them to each other again. We both teared up a bit. It's amazing how much power a certain place can hold. Continuing on the trip down memory lane we visiting the site of our wedding reception as well. Although it looked very different without all the flowers, lights, decors and guests we still had a fun time dancing with each other. On our second to last night Doug and I took his siblings down to Tulum for drinks and dinner. If you have never been to Tulum I urge you to go at some point. Tulum is a perfectly serene strip of beach south of Playa del Carmen studded with small hotels or "palapas." Some of them have power (most don't). Doug and I stayed in Tulum on our first ever trip to Mexico in a palapa directly over the ocean. The food in Tulum is amongst the freshest, cleanest, most delicious anywhere. For dinner in Tulum we ate at La Zebra, our favorite spot in the area. The cocktails are all made with fresh squeezed juice, fresh coconuts, and herbs. My spicy margarita was truly divine. Everyone ordered the fresh caught grilled fish-beacuse that's what you eat in Tulum! Sadly, due to the limited lighting it was to dark by the time we got our entrees for me to get a picture!